Interior designing for a home makes it looks good and makes a great impression by creating a welcoming environment. The designing differs for a large space and a small space interior. Usually people think how to design the interior of a house if it is a small space. So, here are few designs how to decorate your interior if it is a small space. Here the interior designs gives you an idea how to design a living room and a bedroom. Bedroom includes a bed, closets, wardrobe to store your accessories whereas your living room includes couches, sofas or chaises, coffee table, Tv unit. The interior design enhances the exterior and interior space of a house which creates a aesthetic atmosphere and makes you feel pleasant. 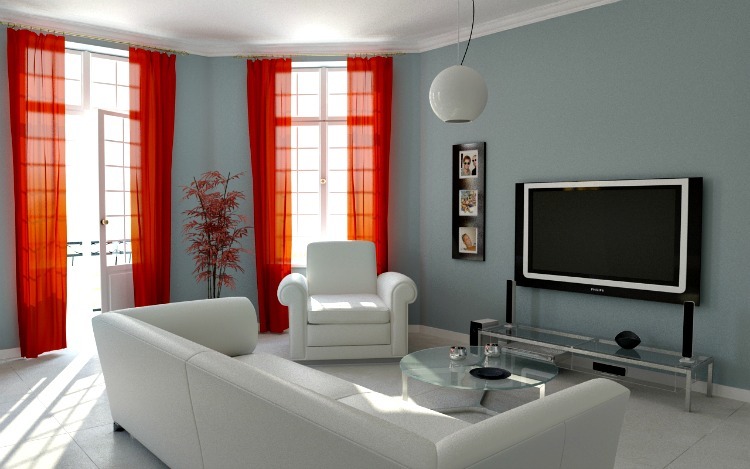 This image shows you a small space interior design of a living room. Here you have a contemporary sofa with cushions and looks elegant. The flooring is made with the tiles which are glossy with a textured carpet. It has a coffee table for serving and a centre table made of glass which is decorated with the flower pot. You can even see a cabinet which store accessories or books and has a lamp. Here is a chaise lounge to have a nap or for relaxation. The wall has gallery frames and can even place a painting. The room has casement windows which are covered with sheer curtains. In the view of the image you can see a small space interior of a bedroom. The interior is decorated with wood and mirror cladding which contemplates the classy room. The room has casement windows with eyelet curtains and the flooring is made with the hardwood and has a striped saturated color carpet. It has a comfy divan bed with a thick duvet. The room has a pouf, couches for seating while you are reading a book or for refreshment. There is also a small table for your laptop. The false ceiling is dry wall ceiling with a pendant light. 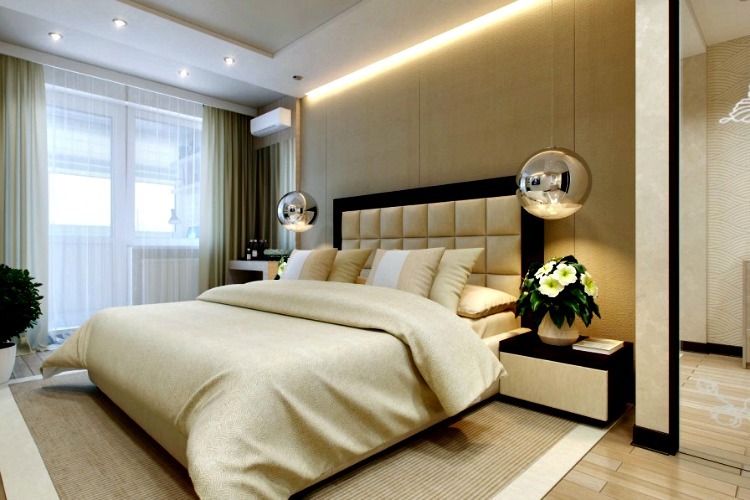 See that you place a few things in your bedroom so that it looks elegant. The living room looks hunky with the red cushions and is eye catching. The room has small pace but looks elegant. It has midcentury sofa with colorful cushions. It has plastic chair and a couch and the room is decorated with the frames and portrait. The false ceiling is a dry wall ceiling which is plain and is inexpensive. The flooring is made of wood and has a velvet plush carpet with leather made hassock. It has two tables on which lamps are placed. The room has plants which makes the room to look neoteric. It also has windows with string curtains. The bedroom is well designed and looks sophisticated with a Austin king size bed. As the space is small on the either side of the wall you will have a closet or wardrobes for dressers or to store accessories. The interior is decorated with wooden wall cladding behind the divan bed. The bed is good looking with the quilt and pillows. It has small tables to place display items or vases. This room also has ornamental plants and the flooring is made of wood with a modern plain rug. The false ceiling has lights and pendant lights. The room has casement windows with sheer curtains. This image is a interior of a beautiful living room. If you have a small space then you can choose this design where it has a wall paper and the frames are mounted on it. There is a tv unit with wooden wall cladding behind it and a closet where slam pottery has been decorated. There are cabinets under the wall cladding to store messy things or accessories. The flooring is made with plain ceramic tiles and has a textured carpet. It has modern sofas with sky blue cushions and has a wardrobe. Be sure that you do not place knick knack things so that your room looks cramped. In the view of this image you can see cozy bedroom. The interior is decorated with the mirror which reflect the beauty of the interior and has picture windows decorated with eyelet draperies. The ceiling is plain and has a massive crystalline chandelier which gives a striking appearance to the entire room. It has a standard bed with pillows and a duvet. The room has a chest of drawers for storing and it has a lamp and flowerpot on it. The room has a couch and a coffee table. 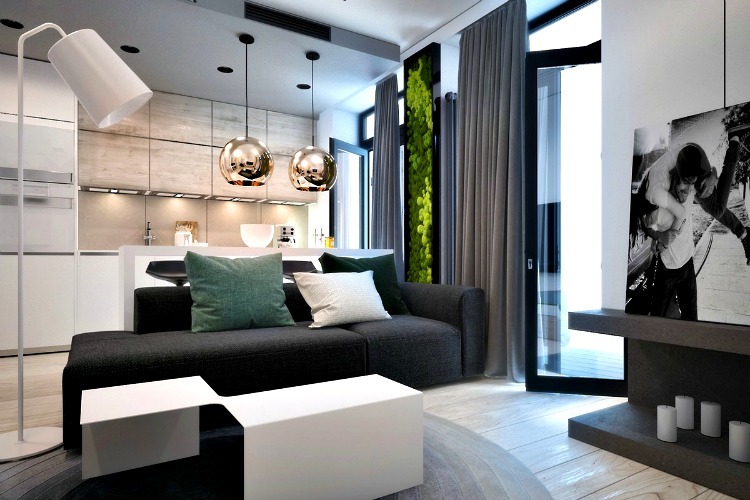 This image shows you a small space modern living room. It has suspended ceiling with the metal pendant lights and is sparkling. The interior has a mini bar with cabinets to place adornments. The flooring is made with wide plank hardwood and a plain textured carpet is laid on it. The modern coffee table looks ultimate and the room has closets to place display items and it has a frame on it. The sofa is comfy and compensate the contrast looking for the interior. The living room has sliding doors which has tab top draperies. In this image you can view a tiny bedroom. It has a simple bed with a grey duvet, pillows and the flooring is of plain vinyl flooring. The design is inexpensive and the interior has wall cladding with warped hardwood. It has double hung windows covered with valances. You can even hang a pendant light or chandelier which makes the room stunning. The bedroom has wardrobe to store accessories, clothing and a table which has a lamp on it. This image views a small living room which is homely. The interior is decorated with light colors as scandinavian style with the outlets of bright tangerine sheer curtains. It also has an ornamental plant and is fair. The dry wall ceiling is plain with a pendant light attached to the roof. The flooring is made of ceramic tiles and has a modern snowy white couch with a contemporary circular coffee table for plating and serving. It has a tv unit attached to the wall, if you want you decorate the interior with your handicrafts, paintings. This living room of small space looks classy and elegant. 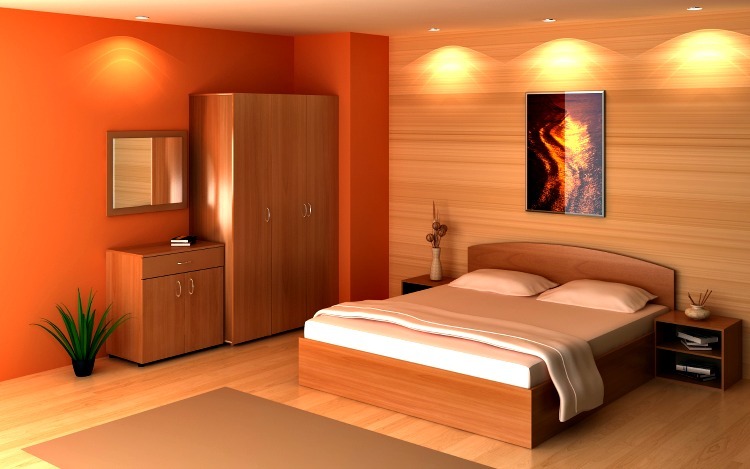 The entire bedroom is decorated with the wall cladding with warped wood and the dry wall ceiling has lights and other side of the wall is decorated with orange color. It has a cabinet, wardrobe in the living room. The bed is rustic and modest with pillows. 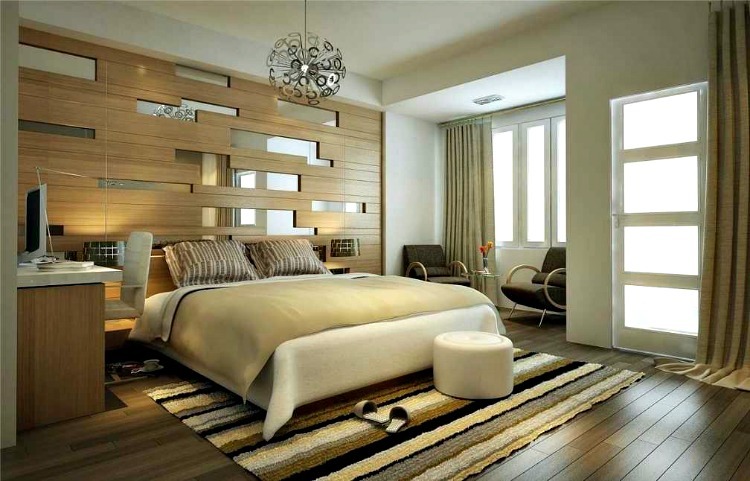 The wall cladding has a wall art attached to it.If you want a simple and classy bedroom choose this kind of designs.